Architect Sue Fujimoto Sou Fujimoto designed facility "nomadic" for FIAC gallery Archi-new - Free Dwg file Blocks Cad autocad architecture. Archi-new 3D Dwg - Free Dwg file Blocks Cad autocad architecture. 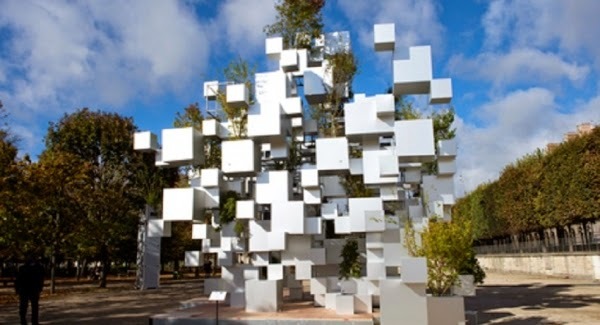 The Japanese architect Sue Fujimoto Sou Fujimoto design temporary architectural structure in the heart of the park Jardins des Tuileries in Paris of a set of metal cubes outstanding addition to the plants to be displayed at the Art Gallery FIAC. Fujimoto has designed this property under the title of "many small cubes" Many Small Cubes favor showroom Parisian Philippe Gavier Philippe Gravier, so some of them filled with plants and other trees as section arranged so connected to each other; either through the corners or ribs. Through this collaboration facility is designed to look like a random collection of nails and holes within the yard surrounded by trees in the park. Represents the space in the center of composition "living space" with a formal entrances on both sides as well as the presence of several additional points of entry in the event of the "inside did not mind in the lower his head," according to architect Fujimoto's remarks. The intention behind the design representation house, "Badawi," so does its job, in part, as an intervention architect and the other part Kmenhoth. "Create a floating blocks of facility," many small cubes "a new experience for the vacuum, rhythm of the shadows and lights alternating as if it were one under the tree. Pose architecture unified element is balance design and Astaqrarha carefully: where he participates every cubic every tree macroeconomic stability site however arrive sense erratic than nearly architecture of nature. " Been suspended cubes on a steel frame, as well as has every cubic of sheets of ionized aluminum, which have been cut and fitted into place manually industry. Were also built nearby tower of scaffolding device has a projection of images that appear on the surfaces of the cube from one side of the facility Alagueth.